James J. Gift D.D.S, M.S. Words can not express my feeling of appreciation. 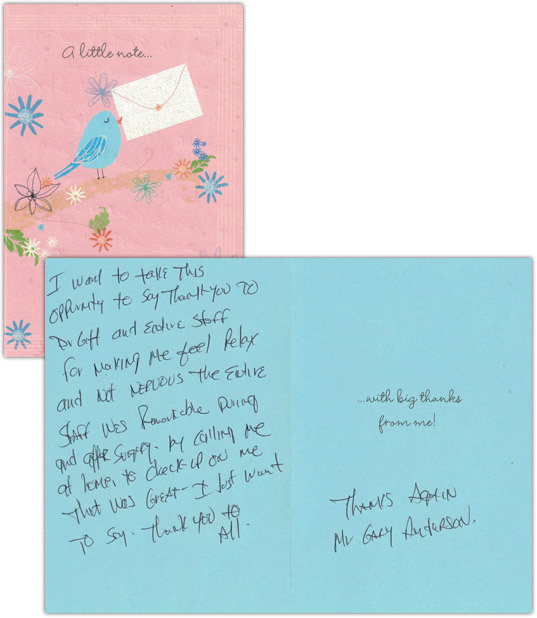 Your kindness & professionalism is changing my attitude about falling on hard times. I am blessed for this opportunity you have given me. My spirit has risen and know I will come out of this and give back. Getting only wisdom teeth pulled has been a long waited event. I am privileged to have you remove them. Thank you for helping me to face and overcome my fears. I know that I can do anything and you have made it easier to decide to let them go. Thanks to your team for working with me through my phases of indecision. Thank you for all the ways you make this world a brighter one, including my smile. 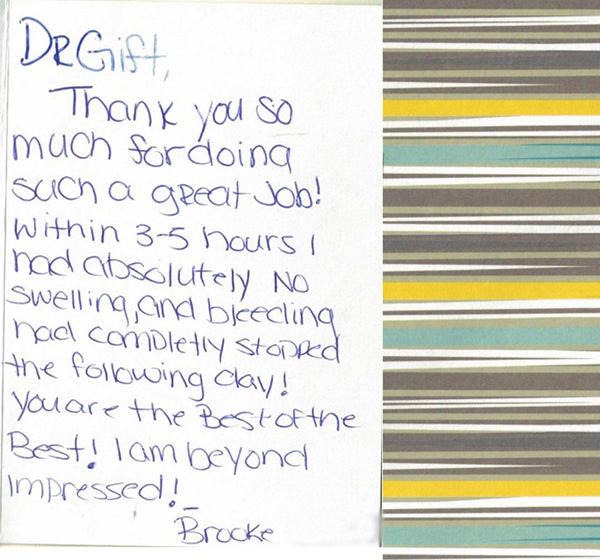 Getting a tooth pulled is never fun, but you and your staff made the experience enjoyable. I’ve never had so much concern and professionalism displayed. Dr. Gift called, checked on me, and then the office called. Thanks so much for your professionalism. I want to take this opportunity to say thank you to Dr. Gift and the entire staff for making me feel relaxed and not nervous. 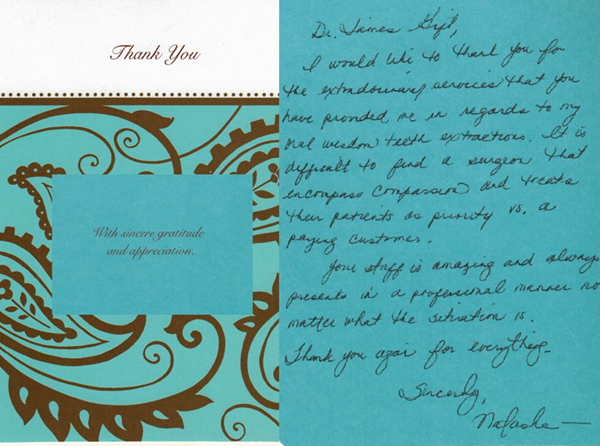 The entire staff was remarkable during and after surgery by calling me at home to check-up on me. That was great. I just want to say thank you to all. I want to thank all of you (even before my procedure) for putting up with this whiney and confused dude. 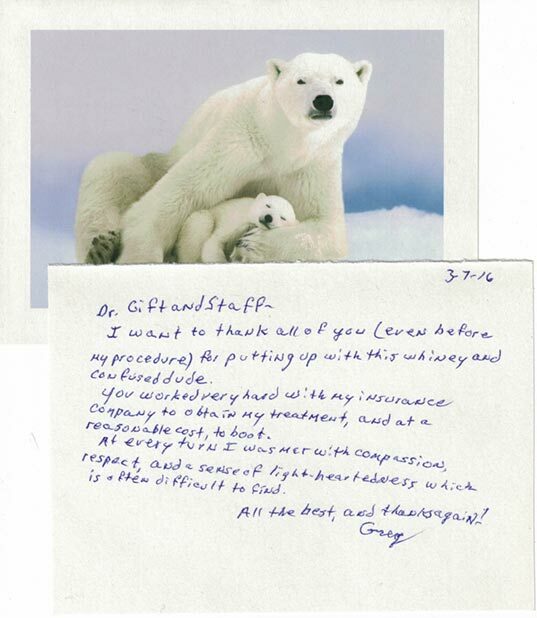 You worked very hard with my insurance company to obtain my treatment, and at a reasonable cost, to boot. At every turn I was met with compassion, respect, and a sense of light-heartedness which is often difficult to find. Just wanted to give you a token of my appreciation. I can’t thank you enough for all of your help and just how kind you were to us. You truly are one of the best! Just wanted to thank you all from the bottom of my heart. It is very rare these days to walk in to a doctor’s office and feel so welcome by the staff. You by far are #1 in my book! Thank you for your kindness and all of your help. 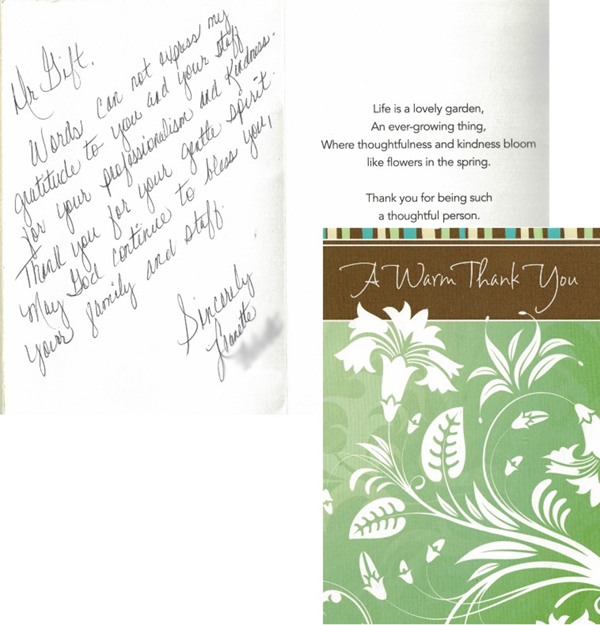 The — Family, especially Ryan, want to thank you for your exceptional patience & kindness! 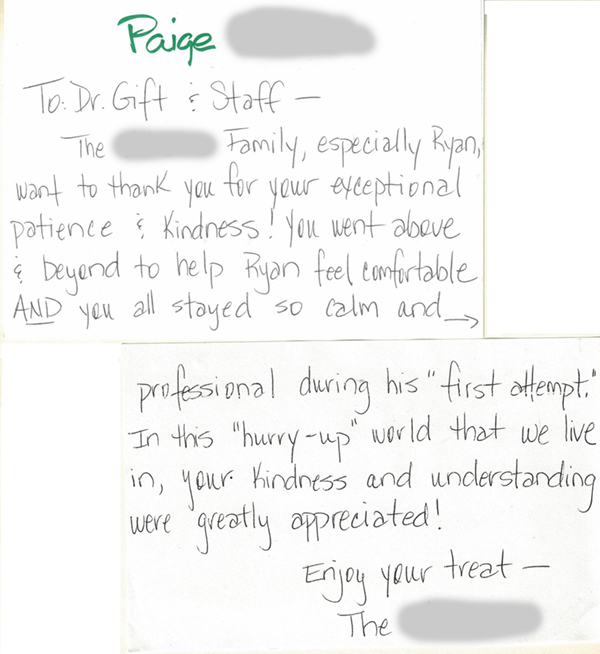 You went above & beyond to help Ryan feel comfortable AND you all stayed so calm and professional during his “first attempt”. 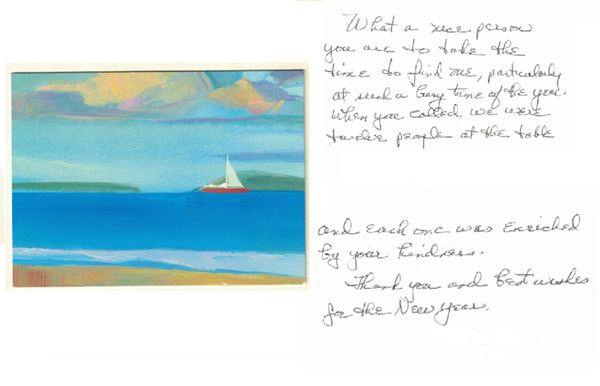 In this “hurry-up” world that we live in, your kindness and understanding were greatly appreciated! 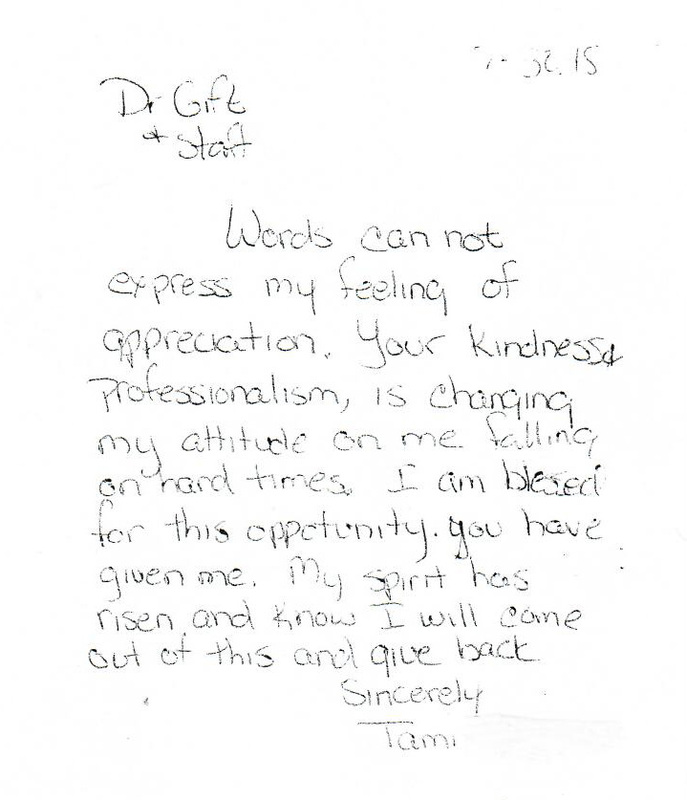 Word can not express my gratitude to you and your staff for your professionalism and kindness. Thank you for your gentle spirit. May God continue to bless you, your family and staff. So grateful for such a wonderful, knowledgable staff. 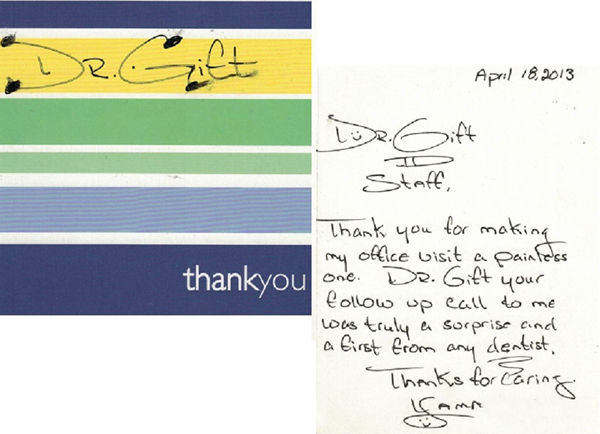 What a “gift” to your patients!! I don’t think oral surgery can ever be a fun experience, but you made it as bearable as possible. There was no swelling, bruising, or bleeding, and the pain was mild after the first few days. After a week, I was able to go back to playing tennis and doing other activities (not that I did much, because it is summer vacation, after all). I’m glad we came to you to extract my wisdom teeth. No other oral surgeon could have done a better job. Thank you so very much for all you’ve done. I really appreciate you calling to check-up on me after the procedure. Despite my “white coat HTN”, I appreciate your calm demeanor and sense of humor. It made everything so much better. Everyone at your office has been excellent. Thank you for your time. Thank you so much for doing such a great job! Within 3-5 hours I had absolutely no swelling, and bleeding had completely stopped the following day! You are the best of the best! I am beyond impressed! 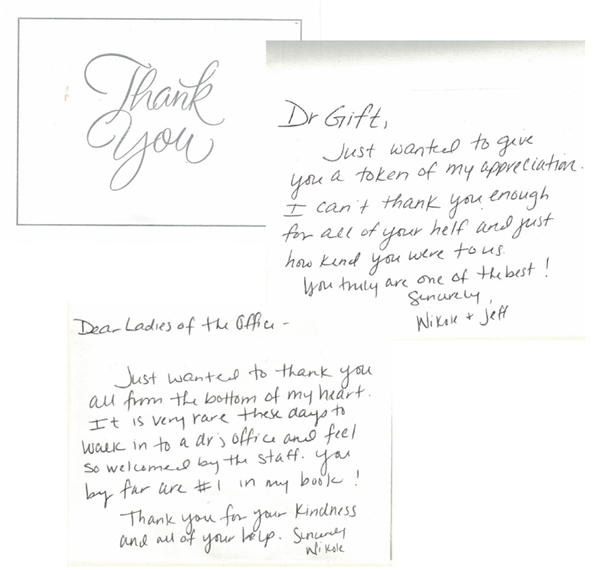 Your skill, care & compassion made for a great outcome. I cannot express to you how very grateful I am to you all. I will happily recommend your office to anyone! You are all wonderful! I was sent to you by another doctor. I had to have surgery on both bottom jaw bones because another doctor extracted 3 teeth in the back and did not do it right. After 3 surgeries from the other doctor I was sent to see Dr. Gift. He did a CT Scan, and I had something left in my jaw. Dr. Gift did the surgery and it took him 1 hour and 15 minutes. My recovery was the best anyone could pray for. I have to take blood thinners because of two heart attacks. But Dr. Gift promised me he didn’t have to stop the thinners. Dr. Gift did my surgery on a Thursday 7:15am and by Friday afternoon I was up and going. He is a true blessing from God and has hands of gold. God bless this man with the name of Gift. Because he is a blessing from God with hands of steel & gold. He is truly a Gift from God. 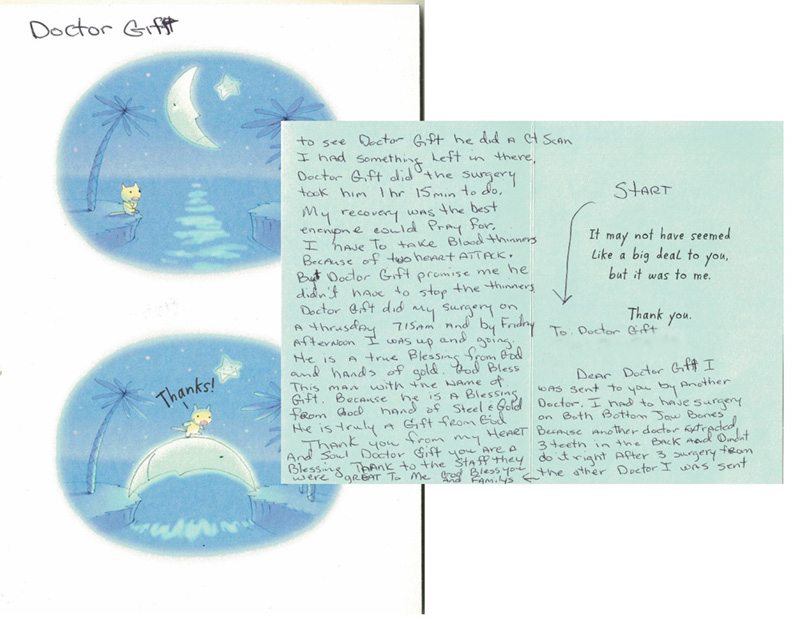 Thank You from my heart and soul Dr. Gift you are a blessing. 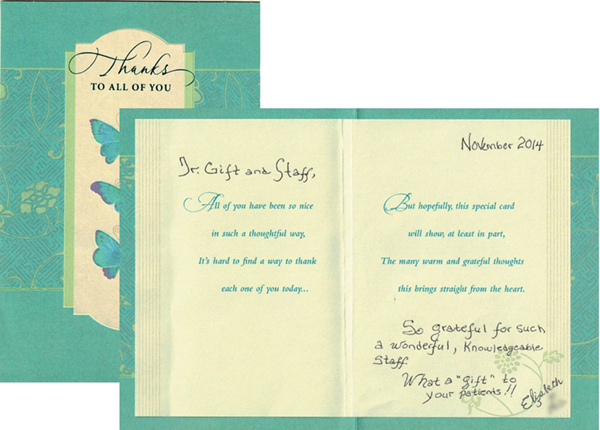 Thank You to the staff they were great to me. God bless you and family. I just wanted to thank you all for being so amazing. I chose Dr. Gift because of all the incredible reviews I read online- and they couldn’t be more true. 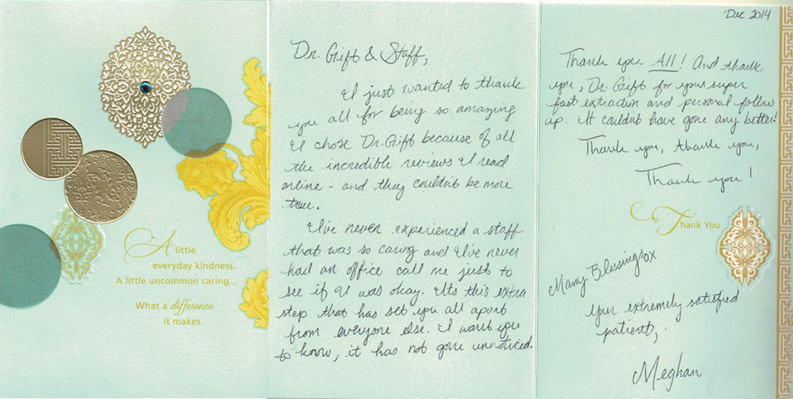 I’ve never experienced a staff that was so caring and I’ve never had an office call me just to see if I was okay. It’s this extra step that has set you all apart from everyone else. I want you to know, it has not gone unnoticed. Thank you all! And thank you, Dr. 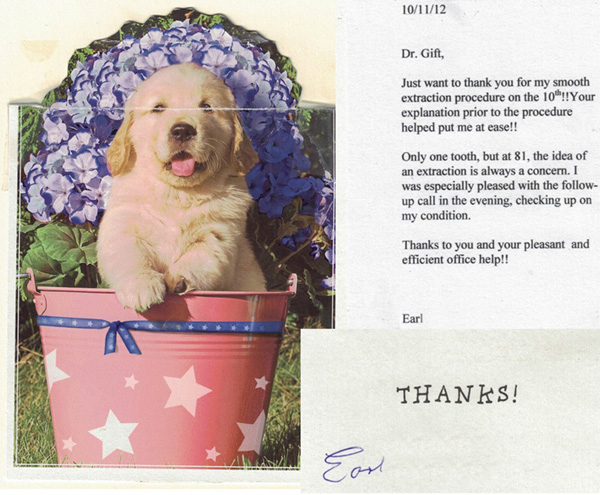 Gift for your super fast extraction and personal follow up. It couldn’t have gone any better! Thank you, thank you, thank you! Many blessings. 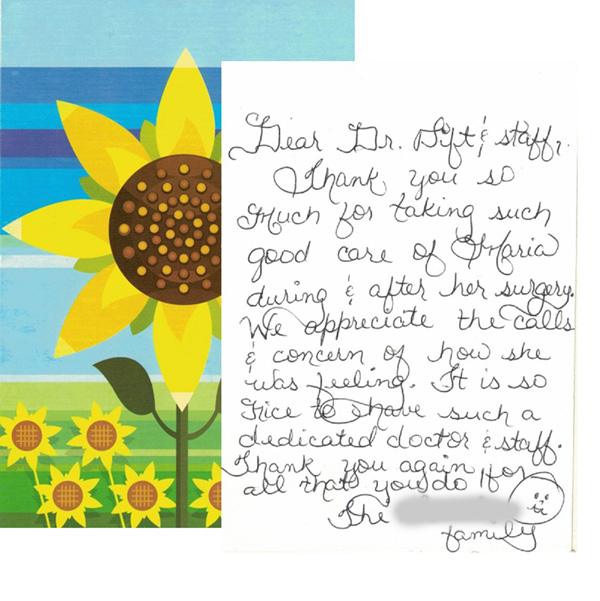 Thank you for taking such good care of Maria during & after her surgery. We appreciate the calls and & concern of how she was feeling. 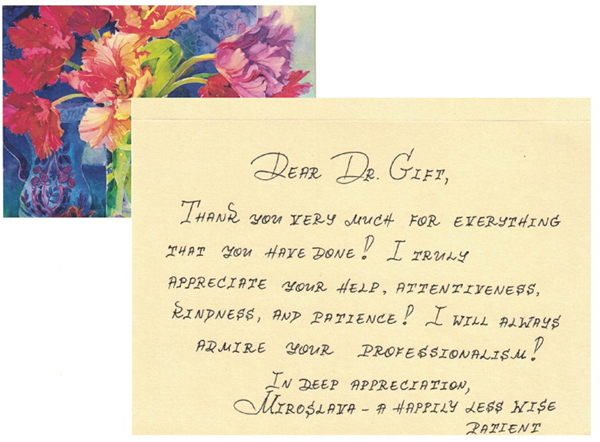 It is so nice to have such a dedicated doctor and staff. Thank you again for all that you do. Thank you for taking such excellent care of me during my recent dental procedure. In my old age I don’t remember if I sent this to you. I had a molar (31) pulled out several weeks ago. I was very pleased with everyone in your office. 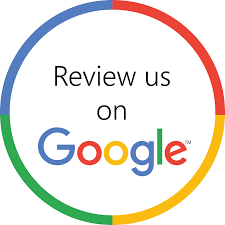 Each assistant was knowledgeable & very helpful. Thanks again for making my tooth extraction an easy experience. I would like to thank you for the extraordinary services that you have provided me in regards to my oral wisdom teeth extractions. It is difficult to find a surgeon that encompasses compassion and treats their patients as priority vs. a paying customer. 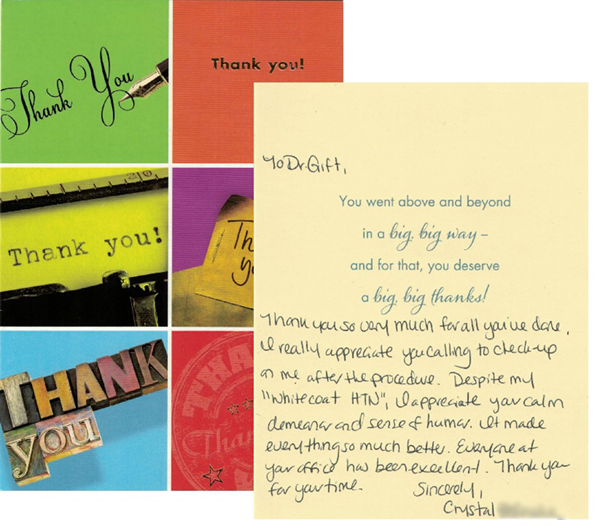 Your staff is amazing and always presents in a professional manner no matter what the situation is. Thank you again for everything. Thank you for making my office visit a painless one. Dr. 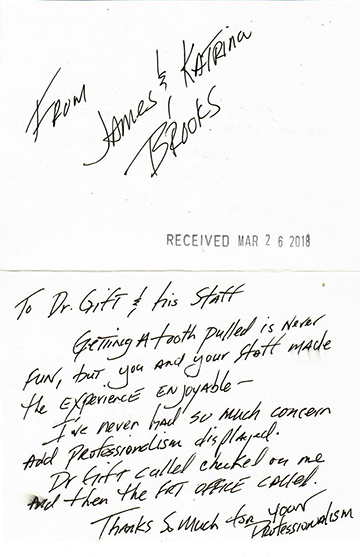 Gift your follow up call to me was truly a surprise and a first from any dentist. Thank you very much for everything that you have done! I truly appreciate your help, attentiveness, kindness, and patience! I will always admire your professionalism! We want to extend a sincere thank you for your care & expertise regarding Jordan’s surgery. Everyone was so pleasant & professional. Thank you Dr. Gift for the special touches of escorting Jordan to the car & even calling our home to check on him. We appreciate you very much. 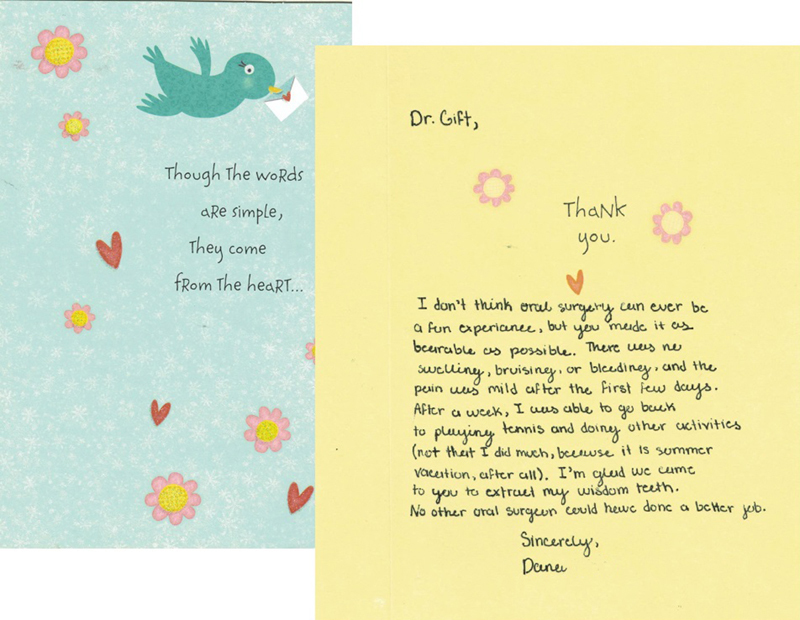 With my thanks to you no one could have been treated more gently and kindly than I was during the time of my extractions. In my opinion you should have “crowns”. Thanks again and you have my heartiest recommendation. Just want to thank Dr. Gift, He did a great job! I was very nervous. It was my first time ever going under anesthesia, he did such a great job and he put me at ease. He extracted my two wisdom teeth, was done in 20 mins. I would recommend anyone to him. Thank you Dr. Gift and staff for making my wisdom teeth extraction a pleasant experience. 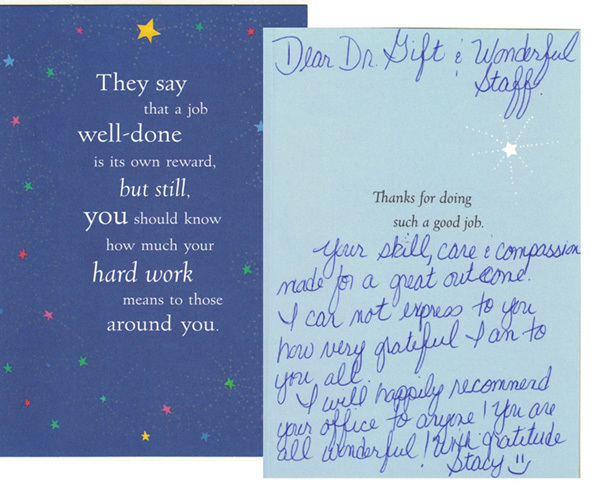 After much anxiety, your humor combined with your staff’s amazing attention to detail exceeded my expectations. Day one post op and I’m feeling great! God bless! You’ll definitely be recommended. I had all 4 of my wisdom teeth out today (day before Thanksgiving). I feel wonderful. Dr. Gift eased all of my worries and was nothing but a TREMENDOUS help! The operation took only 20 minutes. The fact that I’m not in too much pain shows how good of a dentist/surgeon he is! I was very surprised over how caring he was. I expected them to have my husband walk me to our car or him have a nurse bring me, but he himself wheeled me out to the car and helped me get in. When I woke up I also had a voicemail from him checking on me and reminding me on things I can start doing tomorrow. He also told me I could call him if I had any questions at all… What a great, helpful dentist to be willing to answer anything on Thanksgiving!! I couldn’t be more pleased with my operation! I’ll definitely be referring him to everyone I know for dental work! Thank you so much Dr. Gift for making my experience go much, much better than I expected!! You’re the greatest!! Just want to thank you for my smooth extraction procedure on the 10th!! Your explanation prior to the procedure helped put me at ease!! Only one tooth, but at 81, the idea of an extraction is always a concern. I was especially pleased with the follow up call in the evening, checking up on my condition. Thanks to you and your pleasant and efficient office help!! James J. Gift D.D.S, M.S – Board Certified Oral Maxillofacial Surgeon © 2019. All Rights Reserved.